DotA 6.68c AI Fun v2.4c Map | More than 25 Fun Heroes! Another DotA AI Fun map has just released! For those who not yet familiar, DotA AI Fun is a regular DotA AI map which is added with (lots of) fun heroes (see the above picture). It is Deel, a member of PlayDota forums, who decided to continue the DotA AI Fun map development (the original maker is Overflow). 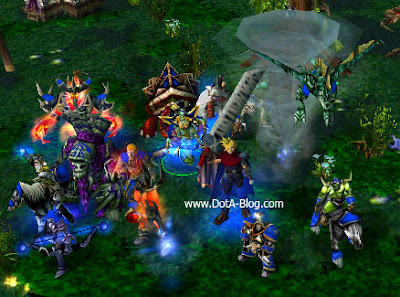 Even though he's not yet added new contents, at least now we can play the Fun heroes in DotA 6.68c instead of DotA 6.67b. Check out the download link and tavern list below! Nice map. Thanks a lot, boyz! Yeah2.. Where's 6.70 and 6.71 ai anyway? Cant keep holding on too long..arghh!! waiting for more AI maps..
plz... plz... plz... add in the old storm spirit!!! the fun heroes too imba -__-"
Who Want to Fight Our GrouP? help!! after i downloaded the map.. then transfered it to the map folder of warcraft. then i start the game.. i can't see the map at the list of maps.. what should i do?? Where is Ramza Beuluve ?